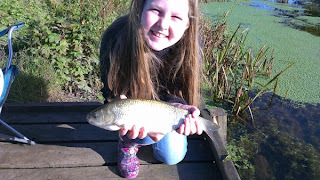 Fish of the Month October Entry - Roach on the Drop! Young Hannah Pinkerton caught this cracking Roach on a single Maggot fished on the drop! She has only been fishing for a few months and loves catching Roach!